Product line : S.H. Figuarts. Series : Pirates of the Caribbean. Manufacturer : Bandai. Release date : 2017-07. case of loss. Weight: 2kg. Weight: 30 kg. than 2 kg. 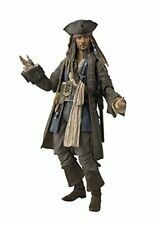 Authentic SH Figuarts Pirates of the Caribbean Captain Jack Sparrow. Condition is New. Was displayed in a detolf case. Comes from a pet and smoke free home. Shipped with USPS Priority Mail. Minimum age: 15 years old or more. Natural poses produces a wide range of motion. It's the S.H.Figuarts! Release date: 2017 / 7 / 15. Manufacturer part number:-. Part number:-. An overwhelming fidelity by using a digital coloring technology of the soul. 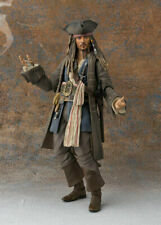 Bandai S.H.Figuarts Pirates of the Caribbean Captain Jack Sparrow. Original: Pirates of the Caribbean. I live in Akihabara. (take 2-4 weeks). (take 4-8 weeks). Interchangeable Hand Left (4types) / Right (4types). Paintwork is done partially by hand and therefore each product may differ slightly. Using digital coloring technique of soul, overwhelming recall. Collection manageable size of the overall height of about 150mm. Natural poses the rich range of motion produce. Quality and affordable price of consent. Using the digital coloring technique of the soul, overwhelming degree of reproduction. It is easy to collect with an overall height of about 150 mm. Natural posing produced by abundant range of motion. AC95-100V / 50-60hz, Plug Type A. I would appreciate your understanding. Release date : 2017/07/15. Therefore we can't make a definite promise that manufacture branches of your country can accept repair. Li-ion Battery. We do our best for you!! Label: Bandai. Natural posing produced by abundant range of motion. Using the digital coloring technique of the soul, overwhelming degree of reproduction. Movie, Captain Jack Sparrow, has appeared on S. H. Figuarts. Natural posing produced by abundant range of motion. I will find one for you.I listen to what you want. Using the digital coloring technique of the soul. Country/Region of Manufacture Japan. ConditionID 1000. Bandai 147756 S.H. Figuarts Pi. rates of the Caribbean Captain. Initial failure warranty. Model Number. length(cm)18. We will do our best with responsibility until you receive your item. The warranty covers only in the case of manufacture's defects. Li-ion Battery. Country of Manufacture. Check the ingredients and consider your allergies. We accept only unopened item. expedited worldwide EMS about 1 week yes. We will send the item to you with our whole heart. [ Multiple sizes and colors ]. the manufacturer will change contents, date and quantity for sale. [ Release Date(yyyy/mm/dd) ]. [ Li-ion Battery ]. [ Country of Manufacture ]. BANDAI SPIRITS (Bandai spirits). We also deduct handling fee. Pre-sale product - We will advise release date. About 150 mm. We were once a small software developer before we realized our genuine passion was for bringing the rich pop culture of Japan out to the people of the world! Product details. 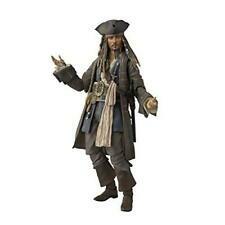 Pirates of the Caribbean Captain Jack Sparrow Figure S.H.Figuarts BANDAI 5.9in. Even if you think to yourself, "But the item I want is only available in Japan.". We will look for and suggest the best products on your behalf. Using the digital coloring technique of the soul, the overwhelming degree of reproduction. New S.H.Figuarts Pirates of the Caribbean Captain Jack Sparrow,From Japan. Weight : 50 0g. I inform the people of the world of good products in Japan and I hope that the people of the world use it. Best regards.